by Wendy McCormick. Center for Congregations, 2015. Accessed November 16, 2018. It’s been said that the website is the congregation’s new front door. A current, user-friendly website is a must for a congregation. The website needs to make a great first impression and function well for its us­ers. To meet this need, your congregation may decide to start from scratch and build a new website, or you may choose to make significant changes to your cur­rent website. 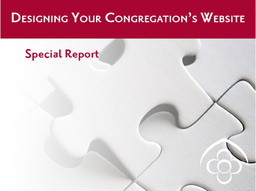 Before you begin, check out this report, highlighting the experiences of other congregations and the advice of professionals in the area of congregational communications and websites. We asked communications and website profession­als what makes their congregational clients successful and satisfied with their web projects. And we talked to congregations who hired professionals and those who opted for a DIY site. We asked what they learned and what advice they would offer to others embarking on this journey.